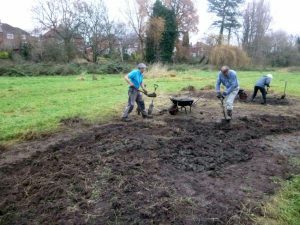 This seasonal task work day – we’ll be carrying out general maintenance of the site, scrape building and sowing/planting – is part of our York Becks Project, which includes restoring the wetland meadow at Heworth Holme. Our aim is to make this valuable green space more colourful and attractive for both the local community and wildlife. Heworth Holme is a remnant of old countryside in the town, protected from development by its regular winter flooding and part of a wildlife corridor between St Nicks Nature Reserve and other green spaces along the Tang Hall Beck.